Wolf Soup...? Bob Nieske explains that "I had a friend named Sharon Wolf. You'd look in her refrigerator and think there was nothing to eat, but she could always make a great soup out of stuff you'd never think of putting together. So I wrote a song called 'Wolf Soup' — I recorded it with Jimmy Giuffre on his Soul Note album Quasar (voted Modern Jazz Record of the Year by Jazz Hot magazine) — and later saw how the concept fit the personalities in the band. Everyone is a complete individual, but you put them all together and you get something, um, nourishing." According to writer Kevin Whitehead, Wolf Soup is "good for you, based on unexpected choices, a merging of diverse flavors and tastes...from Charlie Haden to Sidney Bechet: that's the kind of soup we're in." 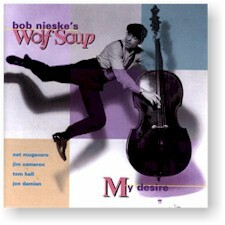 New England bassist Nieske is the founder, leader and composer of Wolf Soup. Best known for his participation in the Jimmy Giuffre Quartet — with whom he toured Europe frequently and recorded three albums on Soul Note — Nieske has also recorded or performed with Duke Robillard, George Russell and the Living Time Orchestra, Alan Dawson, Orange Then Blue, Larry Coryell, The Either Orchestra, Ronnie Earl, Eartha Kitt, Dakota Staton and Herb Pomeroy. He is also the winner of the 1994 Jazz Composers Alliance Jazz Composition Contest and a 1990 Boston Music Awards nominee for outstanding bassist. Other unique ingredients in this recipe are the influential guitarist Jon Damian, effervescent drummer Nat Mugavero and the uniquely symbiotic saxophone work of Tom Hall and Jimmy Cameron. These are not lions, these are wolves. Hear their howl! "...grace and a lyrical touch." "...a very personal harmonic universe." All compositions by Bob Nieske, except as noted. Recorded in July and October 1993 at PBS in Westwood, Massachusetts.